Your donations and souvenir purchases at the event go to benefit the Honour House Society, a charitable organization. 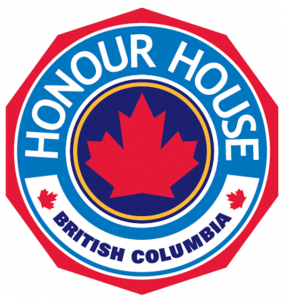 Honour House Society is a refuge, a home away from home for Canadian Forces personnel, emergency services personnel and their families to stay, completely free of charge, while they are receiving medical care and treatment in the Metro Vancouver area. These brave individuals, along with their families, sacrifice so much on a daily basis to protect our freedom and our everyday way of life. Honour House allows us the opportunity to show them that we care and how much we appreciate all that they do. Located on a quiet tree-lined street in New Westminster, Honour House is a beautiful, fully renovated heritage home with 10 private bedrooms each with its own en-suite bathroom. The house has a large shared kitchen, living room, a media room, sun rooms and many other common spaces. The house is fully modernized and wheelchair accessible and is set in its own extensive and lovingly maintained grounds. Honour house receives no direct funding and raises all of its operating costs through donations and fundraising. The house has one full time and one part time member of staff. Almost all of the work needed to keep Honour House running is carried out by our dedicated board of directors and our hard working team of volunteers. *Reproduced from the Honour House Society website.